The advent of book publishing ushered in an exuberant age of plant exploration and discovery. Armed with, and inspired by, the growing botanical knowledge published in books, explorers set out to discover and study the flora of the world. 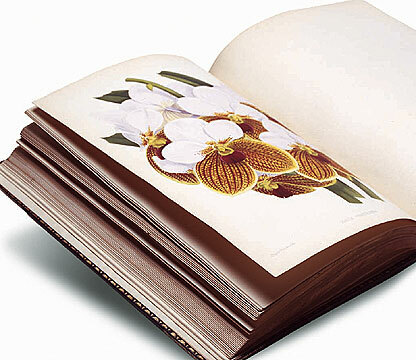 "The Conservatory would most definitely recommend Plants in Print to another organization. The exhibition text was well researched, contains an amazing collection of books, and was displayed in the highest standard. The Chicago Botanic Garden staff was very professional and pleasant to work with. We were pleased to have displayed Plants in Print at Franklin Park Conservatory and Botanical Garden." Plants in Print: The Age of Botanical Discovery is a collaboration between the United States Botanic Garden and the Chicago Botanic Garden to share the rich history of botany and plant exploration with a nationwide audience. The exhibition includes thirteen exhibit cases, book mounts, five free-standing interpretive wall panels, supporting materials, and a special and unique selection of rare books describing five centuries of plant exploration around the world.